It might be hard to believe, given how complex they can seem, but high-end audiophile headphones don’t usually have a lot of gimmicks. Oh sure, they’ll pack in magnetic planar diaphragms and nanofilament neodymium geegaws, but when it comes down to it, they’re just headphones. Expensive, very high-quality headphones, but headphones nonetheless. The Sennheiser HD630VBs are different. They’ve got a gimmick that is so simple and so effective that we can’t understand why it hasn’t been done before. In this review, we break down HD630VBs’ sound, design, comfort and fit, packaging and accessories, specs and more. To see alternatives, read our list of the best high-end headphones. The killer feature of the Sennheiser HD630VBs is being able to adjust the bass. This, of course, is not a new feature – any pair of headphones with an EQ has that covered, and it’s been around for years. But the HD630VBs do something a little different. Instead of adjusting the bass with the push of a button, or with an app, you alter it by spinning a wheel around the outside of the right headphone cup. When we first unboxed the headphones, we had the idea that the single twist of the VB (Variable Bass) dial would raise the bass to ear-shattering levels. We couldn’t have been more off-the-mark. What quickly becomes apparent, even in a short listening session, is that the headphones aren’t a sledgehammer. They’re a scalpel. Even adjusting very small amounts has a noticeable difference, and at the very maximum level, the bass remains refined and clear. It’s so easy to get the exact level you want, that we found ourselves playing with it more than we would have thought - experimenting with different levels to see which ones we liked. Outside of a first-person-shooter, we’ve never had so much precision control with so little effort. This scalpel-like approach might not appeal to everyone. If you’re after pounding bass, the kind that rattles your stomach, you might want to look elsewhere. Compare these headphones to the Beats Pro. Those may be cheaper, at $400 compared to the HD630VB’s $500, but they too set their score by their bass, and they aren’t even close to the quality on offer here. And we should say that we found our comfort zone right at the maximum level; at the opposite end of the dial, there was far too little bass, a necessary state of affairs given the concept, but still. In other words, if you’re thinking about buying these headphones, it’s worth being aware of how you like your music. It’s a feature that would be wasted if the overall sound of the HD630VBs wasn’t up to scratch. Fortunately, it is. It most certainly is. While it could occasionally be a little bit too minimalist and sparse, even cold, the audio quality still felt elegant, detailed and clear. Whether it was taking on a pounding metal anthem or an acoustic folk piece, the sound was crisp and natural. These compare very favorably with other Sennheiser headphones, like the storied HD650s. Those headphones are known for their refined, open and classy sound. And, although the HD630VBs aren’t quite as good, they still match up well. If you aren’t worried about fine-grained control over your bass - and want to try out the HD650s - you’ll find they cost around $368. A little cheaper than the HD630VBs’ $500. What you don’t get when you buy something like the HD650s are the bonuses, which, in this case, include a six-month subscription to Tidal - the somewhat-beleaguered high-definition streaming service owned by Jay-Z. It’s a good way to get introduced to the world of high-def audio, and is a very nice bonus. For one thing, it lets you take advantage of MQA audio, which is at much higher resolution than many other sound sources. You can read more about that here. The HD630VBs are a sizeable pair of headphones, an aluminum-and-leather construction that prioritises comfort and sound quality over portability. The cups themselves are absolutely massive, and although Sennheiser says that you can quite comfortably take these headphones outdoors, we wouldn’t advise it. They might fold up, but they’re just too big. The bulky design is definitely a step away from some of Sennheiser’s other headphones, like the excellent HD1 Wireless (full review here) – formally known, somewhat confusingly, as the Sennheiser Momentum Wireless. That particular pair of headphones had a really classy feel to them, whereas these feel a little more rough around the edges. It’s not a bad thing, necessarily, but you do need to bear in mind that these are a bit of a battering ram. The first thing you need to pay attention to is a tiny switch underneath the earcup. It’s so small that we didn’t know it was there until we glanced at the instruction manual. What it does is lets you switch between iPhone and Android modes, to optimise the sound. It’s a nice touch, especially in a pair of headphones that doesn’t come with a companion app. When testing on both types, we didn’t pick up any major differences between the sound, but it’s still good to have. In all honesty, we can’t think of any other headphones that have used this feature before or since – if you can, please do let us know in the comments below! The controls on the side of the earcup, in the middle of the VB dial, work really well, too. They sit almost flush with the cup, and although it takes a little bit of effort to press them, they still get the job done. We did sometimes find that the volume increase or decrease from each click was a little too granular - meaning that we either had to hold it down or click multiple times to get to the spot we wanted. There are plenty of headphones that handle these kind of volume changes with a lot more grace, including the super-popular Bose Quietcomfort 35 II. Those make quite an interesting comparison, actually: they are cheaper ($349 to the HD630VBs’ $500) and offer noise-canceling, wireless functionality, and integration with Google assistant. But what they don’t offer is control over the sound, or in fact any kind of sound quality that can compete with the Sennheiser model. This is one area where the thick, robust build quality really works well. The headband of the HD630VBs is excellent, covered in padded leather that feels gorgeous to wear. Plenty of high-end headphones – even ones far more expensive than the HD630VBs, like the $799 AUDEZE LCD2C (full review here) – have problems with comfort in this particular area. Not these headphones. This impression is boosted by the cups, which are large enough to fully enclose the ear – you get no pinching when you put them on. We also found that Sennheiser had worked quite hard on the clamping pressure, meaning they were neither too loose, nor too tight, when sitting on the head. We had no problems wearing these headphones for several hours, although – and this is in common with many headphones, especially those of the over-ear variety – we had issues when wearing glasses. The clamping pressure is fine, but introduce spectacles to the mix, and that changes. Packaging for the HD630VBs isn’t worth more than a sentence or two – it’s a simple flip-top cardboard box, lined with foam. What’s worth going into a little bit more detail are the accessories that come with the headphones. The most prominent of these are the hardshell case, opened and closed by a zipper. We really like this case; it felt appropriate for the price, and felt like it would do would decent job of protecting the headphones. You also get a 3’11” cable with in-line controls, which were basic, but worked well. When we tested call quality, we had zero issues. The Sennheiser HD630VBs offer a unique approach to controlling your bass, which we think works incredibly well. The overall design, along with the controls, is very effective. ​The comfort and fit of the HD630VBs is excellent, despite occasional issues while wearing glasses. 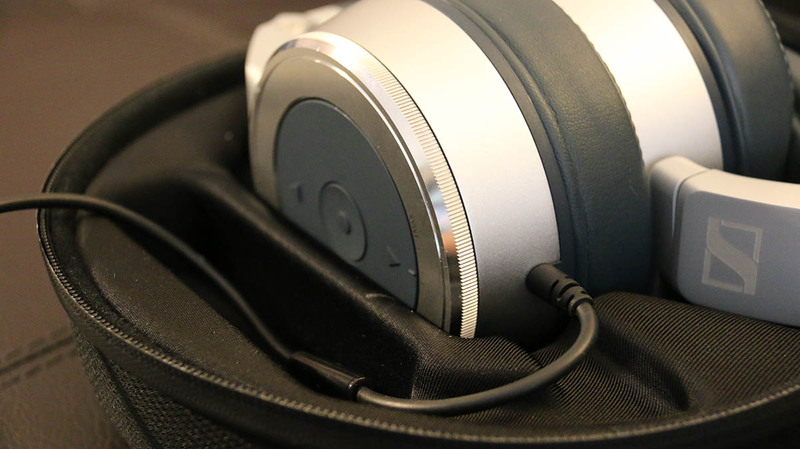 While the HD630VBs fold up, they are definitely not portable. There are other headphones that offer slightly more refinement in the sound, particularly in the highs and the mids. ​They are quite old, and really should have undergone a bigger discount by now. If you’re going to talk about headphone comparisons for the HD630VB, then it makes sense to have at least some of those comparisons be all about the bass. Step forward then, the Beats Pro. Dr Dre’s finest is a sledgehammer where the Sennheiser is a scalpel, clocking you over the head with giant bombs of bass. Which is fine, if you like that kind of thing. Personally, we don’t. The Beats Pro do carry a cheaper price-tag than the Sennheisers - at $400, they are $100 less than the latter's $500 – but we know which one we prefer. If you want something a little more high-end, your first port of call should unquestionably be the AUDEZE LCD2C. They are quite a bit more expensive, at $799, but oh Lordy, they sound good. Thanks to the planar magnetic drivers, the bass is just glorious – far better than either the Beats Pro or the HD630VB. You don’t get any control over it, but it’s still one of the finest headphones currently available. Big thumbs up from us. Since Sennheiser makes so many headphones, let’s compare the HD630VB two a couple of its biggest competitors from inside the company’s own stable. Firstly: the Sennheiser HD650. This open back pair of headphones is a firm favorite. It doesn’t have the same emphasis on low-end as the HD630VB, but it offers near reference grade sound that will appeal to those who prefer things to be a little bit more refined and classy. They are also cheaper than the HD630VBs, at $368. What if you want to go wireless? That’s something that none of the headphones on this list offer. If that is something you’re interested in, and you want to stick with Sennheiser, we recommend their HD1 Wireless. It used to be known as the Momentum Wireless - for reasons that are just too boring to go into - but the HD1 is the same pair of headphones. And what a pair: fantastic wireless functionality, excellent sound, great design. And at $310, at the time of writing, a pair is cheaper than both the HD650s and the HD630VBs.